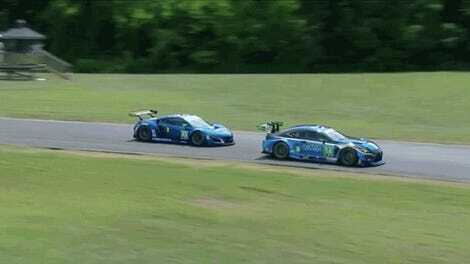 The battle for third place at today’s WeatherTech Sports Car Championship got intense with just under 13 minutes left in the two-hour, 40-minute race at Virginia International Raceway. The No. 66 Ford GT and the No. 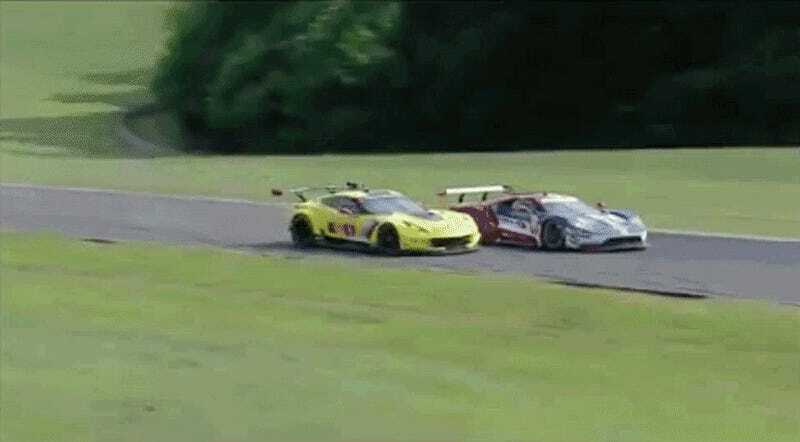 4 Corvette crashed each other battling it out for that sweet final podium spot. The No. 66 Ford Chip Ganassi Racing GT currently sits second in the GTLM-class championship, a mere eight points behind the No. 4's sister No. 3 Corvette. So, they really needed the points in order to jump ahead. Sadly, this intense scrap for third place ended off-track with a spin, and with both cars finishing much further down the order than expected. Seemingly just for good measure, the No. 66 Ford gave the No. 3 Corvette a bump in the nose from in the grass. Boop. Or maybe the No. 66 is trying to kiss and make up with the Corvette. D’awww. Dirk Mueller ultimately brought the No. 66 Ford home in fifth place, and Tommy Milner drove the No. 4 Corvette home in sixth. So, if all else fails, I guess you can still say that Mueller didn’t let Milner in front of him. Meanwhile, the No. 3 Corvette will extend its championship lead as it won the GT-class-only VIR race overall.